Who's driving your Patient Billing process? How does your FQHC measure up? Improve your Patient Billing Services today! Emerald segments accounts to resolve accounts efficiently and ensure the shortest AR lifecycle for your patient billing services. Emerald improves communication to create better opportunities to collect revenue and increase patient satisfaction. Emerald offers 24/7 service to fulfill the financial needs of patients at a time that is convenient for them. Emerald helps our clients achieve their financial goals while focusing on patient satisfaction. Patients can view an itemized list of charges for their hospital billing services, update their contact information, contact our office, or simply pay online. 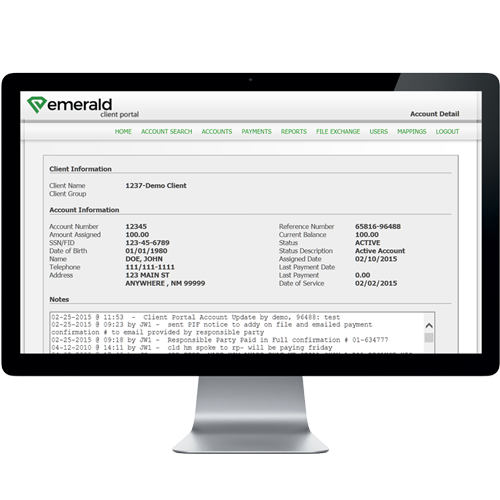 Emerald’s Client Portal is a robust communication platform that gives clients full access to a real-time snapshot into your healthcare billing services through our account database, while providing our clients with pre-built reports, billing statements, convenient account search features, and multi-user access.